It was all started by Marni for H&M, where fashionistas wore pyjamas out of the house as a trend. I wasn't sure about the price of it but I remember that it's not worth it to spend that amount of money on a piece of PJs, so I bought something else of the collection instead. Months have passed and the trend returns, Zara, the #1 runway copycat launched their version as a blazer. Again, I'm not willing to buy in that specific price (cus it's a PJs for God's sake!). Few weeks later, I finally found this perfect shades of burgundy PJs at forever21 for only about 40 bucks! yes that's the price of a PJs should be, lol. Paired it with Zara legging, Venna necklace, Valentino clutch and Christian louboutin pigalle spikes pump. 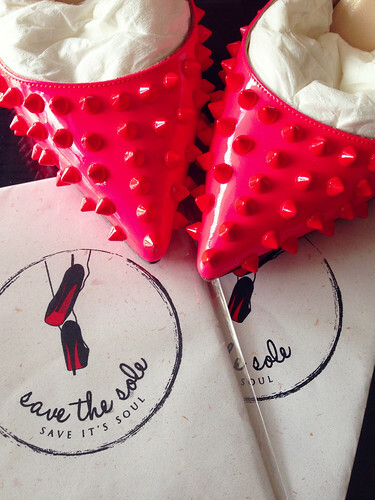 For you who follow me on Instagram (@karinapricilla), I posted about this Save the sole thing few days back. I'm really glad that there's these kind of things that can protect my shoes, which I can stick it easily myself (for some shoes, I protect it with MasterFix's red sole, but unfortunately you can't stick it of your own, they have to do it for you). Trust me it works, other than saving the sole, it also makes the soles less slippery. Contact @save_the_sole on Instagram for details. 2013 Met Gala - "PUNK: Chaos to Couture"